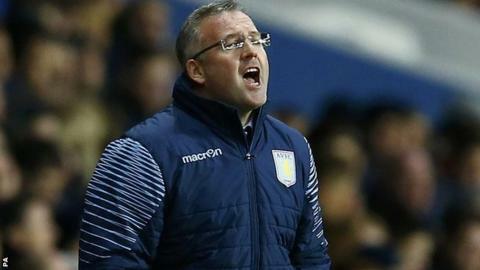 Aston Villa manager Paul Lambert has urged frustrated fans to call off a planned protest at the start of Saturday's home match with Liverpool. An open letter posted on three fans' websites has called on Holte End supporters to vacate their seats for the first eight minutes of the game. The protest is to mark owner Randy Lerner's eight years in charge. "We'll certainly have a better chance of winning the game if they don't do it," Lambert told BBC WM. "You want the fans to stay with us. The players need them. Psychologically, you never know. "There are individuals who can get through it but there can be one or two who don't want to take the ball. "Whoever has planned it, I hope the guy next to them tries to keep them on their seat," Lambert added. "I don't think you can look at the chairman and say it's one guy's fault. It's unfair. He has the club's interest at heart." Last week's 1-0 defeat at bottom side Leicester left Villa 13th in the Premier League, just three points above the drop zone, and reignited the sacking chants that were also a feature of the narrow FA Cup win over Blackpool. On the chants against him, Lambert added: "It's not great. I'm human like everybody else. "The fans have been great with me up until late, and I guess now they are waiting for something to go wrong." Since the Premier League began in 1992, the lowest number of goals scored by a team staying up is 28, by Leeds United in 1996-97. At the moment, with 17 games to go, Villa have scored 11 in 21. Villa have scored in only half of the 12 home matches they have played this season in all competitions. Their total of eight goals scored in Birmingham this season was matched in the space of one afternoon at St Andrew's in October by Bournemouth, next weekend's FA Cup opponents. The club's longest run of successive games without a goal in their history is five matches, under Ron Atkinson in February-March 1992 and Lambert in September-October 2014. Villa are without a goal in their last four Premier League matches, having not scored since Christian Benteke found the net after 18 minutes against Manchester United on 20 December. But they have £3m signing Carles Gil ready to make his debut. "Martin had this club buzzing at that time, vying for Europe, going great, and what's happened has happened."